In certain situations when a person tells you that he or she is a painter, you have to ask for clarification. Do you paint paintings? Or are you a house painter? If you are Lisa Sigal, the answer is not so clear. Sigal is trained as a painter of the art-school variety but she has recently taken to painting on sheetrock, brick, and cardboard. She sometimes uses a skim coat of joint compound to build up her surface, or cuts away portions of a wall as a contractor would. In recent installations the artist has also added dimensional elements that suggest shelters, using propped plywood and cardboard create makeshift homes. Sigal’s installations in the last two years have taken into account the architectural features of the spaces in which they are manifest. The artist renders false support beams and paints artificial shadows, for example. These elements make a questions what we are seeing—we have to wonder what, if anything is real. 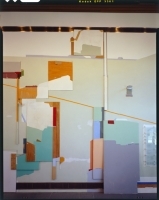 But in the same installation, she will make cuts into the sheetrock walls, and add abstract elements that work against illusion. This allows the works to flip-flop between trompe l’oeil and flat, representational and abstract. Sigal also allows her materials to do what they naturally do—cardboard warps, sheetrock crumbles, and plywood bows—just as they would if a structure were made in haste with cast-off scraps. Components are propped, rather than joined, and the whole effect is crude. The work has a way of making the viewer slightly uncomfortable—we wonder if the structure is secure, or if the plywood is supposed to be bowed. This is deliberate, at one moment we are appreciating the way Sigal’s beautiful palette looks on frayed sheetrock and then we begin to feel as though we are standing before a man sleeping in a cardboard box in the doorway of a church. Lisa Sigal was born in Philadelphia and now lives and works in Brooklyn. She has had recent solo exhibitions at Frederieke Taylor gallery and White Columns, both in New York. Her work was included in recent exhibitions at The Sculpture Center in Long Island City, Queens, the Brooklyn Museum, and Real Art Ways in New Haven. She recently completed a residency at Headlands Center for the Arts in Sausalito, California where she did much of the work for this exhibition.